The Quinhagak dancers practice in the Nunalleq Culture and Archaeology Center. The group is entirely organized and run by Quinhagak youth; most of them have grown up with the Nunalleq project over the past ten years. Members of the Quinhagak dance group take a close look at the Nunalleq collections. Having the artifacts here in the village has an impact that goes above and beyond any of the scientific discoveries we have made over the years. These are complete wooden arrow shafts. Nock ends on precontact Yup’ik arrows are oval in cross-section for a better grip between the fingers. Most arrow shafts show signs of being painted in red, black or a combination of those colors. The arrow points have a conical pointed base that plugs into a hole on the business end of the arrow shaft. That way different point types can be plugged in depending what type of game animal presents itself. The broken ends of arrow points are still embedded in several of these shafts. We find arrows in many sizes including small ones for children. Below are toggling harpoon heads. Finely made from caribou antler, these were designed to toggle, or turn sideways inside the seal after it was hit. The slots at the end held a sharp triangular slate endblade. If you look closely, you’ll see a broken endblade still remaining in one of them. The harpoon head on the far right is a preform, lost or discarded before the final touches could be added. Very similar harpoons are still used by seal hunters in Quinhagak today, although modern versions are made from metal. Ivory and bone fish lures were used as jigs to lure fish to the surface where they could be speared or dip netted. This one is made from walrus ivory and elders say that it probably represents a young northern pike. Sila – a film to be? Last summer Sonia Luokkala and Mischa A. Hedges came to Quinhagak to do some filming and research for a film about climate change and culture in coastal Alaska – there they met, and teamed up with, Jacqueline Cleveland (from Quinhagak) – to make a documentary about Climate Justice in Alaska. They have just launched a crowdfunding campaign to raise the funds for continued production. Follow the link if you’d like to support the project. When we first recovered this hand-sized doll last summer at Nunalleq we thought that it was made from caribou antler. But with closer examination after cleaning it turns out to be carved from mammoth ivory. Fossil ivory was widely used and traded in SW Alaska and is one of the hardest organic materials to carve. 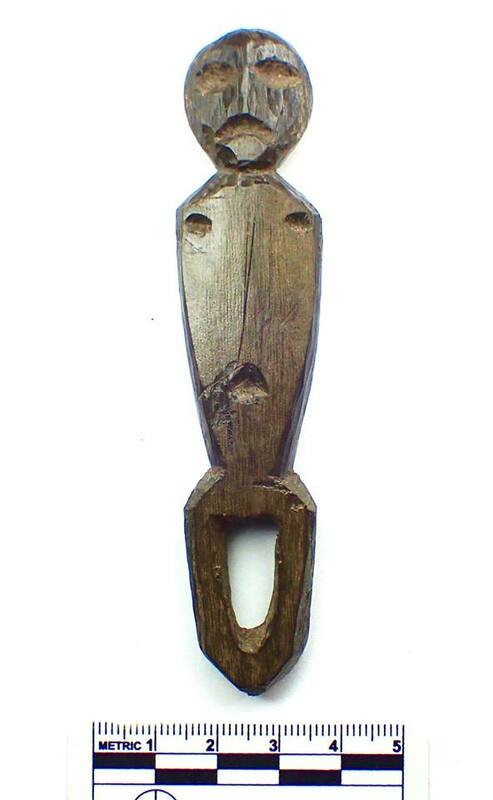 This doll head is simply carved but still conveys a lot of personality. Much of the original red ocher paint is still intact and there is a groove around the edge of the head which held a string which in turn held down hair. The oval dent below the mouth represents a labret, or lip plug. 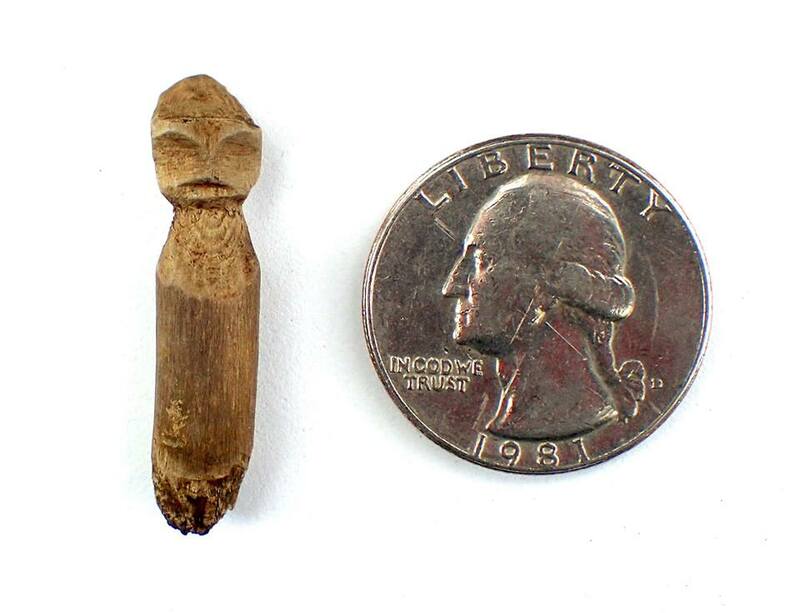 One of the smallest wooden dolls in the Nunalleq collection. 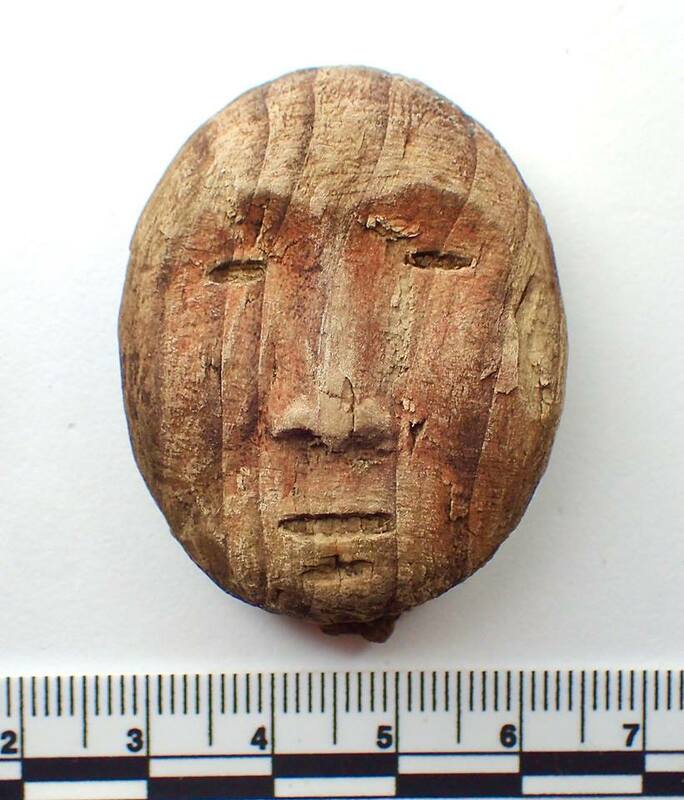 Tiny dolls like this may have been worn as amulets or included in charm boxes. The carver managed an impressive amount of detail despite its size. A full-sized kayak prow. Kayak prows as well as model kayaks from the site show no sign of the oval hole seen in the bow of historic Yup’ik kayaks. Instead bow forms range from pointed to steeply peaked as in this example. A split in the wood was mended with baleen cordage before finally being discarded. It was later used as a dart target which left some small holes in the side. The darts themselves were found right next to it. A complete kayak prow from a model kayak. Most kayak models found at Nunalleq were pieces of wood carved into the shape of a kayak but some models were made complete with realistic miniature frame parts in a similar scale used by historic and modern kayak model makers. We’ve also found miniature deck beams and accessories like tiny paddles. This last weekend I had the honor of attending the esteemed Maryland International Film Festival, the largest film festival in the state, and bringing our documentary, Children of the Dig, with me. Across three days, over 150 movies transform downtown Hagerstown, MD (Population: 40,000) into a bustling art hub. Feature-length films, shorts, animated, foreign, and documentaries from across the world play at the 104-year-old, 1300-seat, neoclassical Maryland Theatre and other venues throughout downtown Hagerstown. It’s an impressive, lively festival, and an opportunity to share the story of Quinhagak with the people of Maryland and the DC area. A huge crowd had gathered for the red-carpet premiere. Like kernels in a popcorn machine, it was overflowing, and alive. Journalists from the Maryland-DC area, the governor and city council, and filmmakers from France to (of course) Alaska were on display. Snapping selfies. Camera flashes. I did my best to introduce myself to anyone I could stop for a second, but my real sights were set on anyone with a mic and camera. Thankfully, I found one. “Here for my interview.” I said, with a smirk. I paused. Her mic was off. Her cameraman gone. She was ready to leave. I had her at Alaska. I think it’s easy to get caught in the bubble of Alaska. I see climate change affecting our shores, our industry, our seasons. I hear people buzzing about artifacts and carvings all the time. It’s easy for me to forget that our big, little state is a world away, and most people don’t know what’s happening up here, but that doesn’t mean they don’t care. “Just so you know, this movie has a lot of Yupik in it.” I said to the small crowd that had arrived for our screening of Children of the Dig. Crickets. Looks of confusion. Looks of “Is that a… thing?” among a couple attendants. A collective, “Ahhh…” spread throughout the crowd. I don’t watch the screen anymore. I like to watch the faces I can make out under the glow of the projector. When I can. What did I make out this time? Well, for one thing, those masks are pretty eye-catching, and while I admit my comedic tastes can be a little quirky, the line “There was this Santa Claus looking guy.” Never fails to play. Nice work, Mike. You’re a star. I think the world is ready to find out. This uluaq was recovered in the 2018 field season. It is still hafted into its original wooden handle. If you look closely at the slate blade you’ll see that it has been hollow ground, much like a modern steel knife. This small uluaq was probably used in a sewing kit rather than splitting salmon. The wooden handle was originally painted with bright red ocher pigment, and further decorated with five insets of white calcite. The ground slate blade is highly polished and very sharp.